Picture this. A woman walking alone on a lonely stretch of road realises she is being followed. Most likely, she will use her phone to call for help. But what if she is overpowered before she realises it and has no time to even get her hands on her phone? Or if the phone has already been snatched? Pepper sprays and other safety devices are now passé. In the technological era we are living in, a simple button concealed in a wearable accessory can alert the family of an impending danger that the wearer is in. Appearances can be deceptive but in this case the deception helps. This unobtrusive watch — known as Safer Pro — is just another accessory but lodged inside is a safety device that alerts family members during an emergency. Targeted solely at women, this watch allows the family to track the live location of a dear one and rush to her aid in an unwarranted and indefensible situation. At other times, from the confines of your home or office, you can rest easy while monitoring the movements of a loved one. 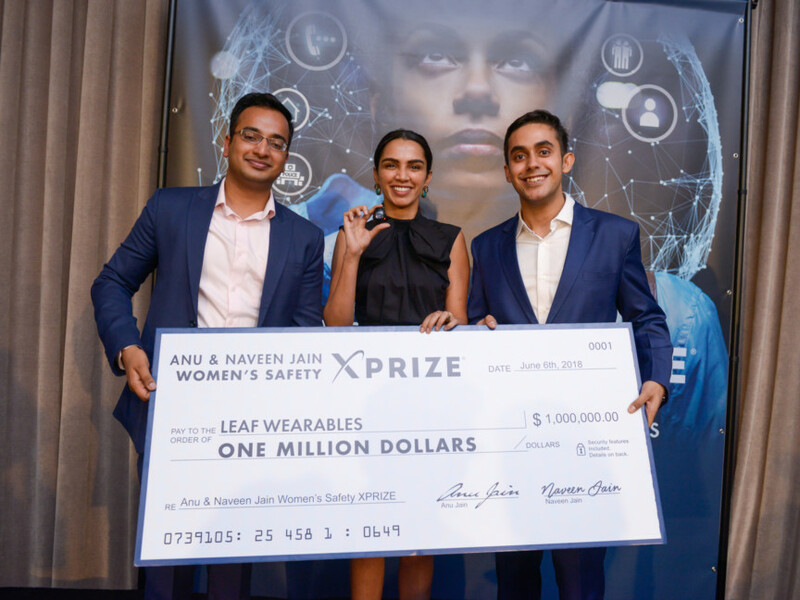 Winner of the first $1 million Women’s Safety XPrize at the United Nations, Safer Pro is the brainchild of Leaf Wearables, a start-up company based in Delhi, India. What makes Safer Pro unique is that one can receive calls on Safer Pro and talk hands free. 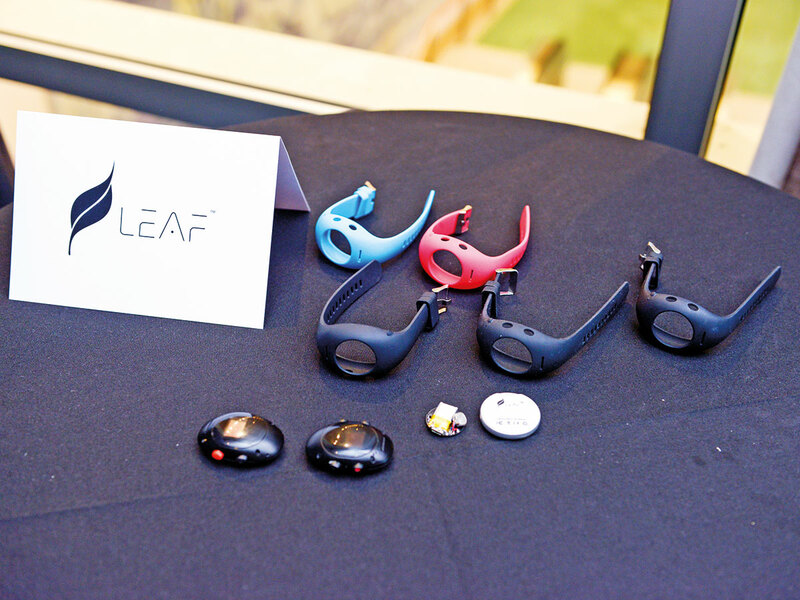 For the five founding members of Leaf Wearables — Avinash Bansal, Paras Batra, Manik Mehta, Chiraag Kapil and Ayush Banka — the prize was the culmination of a long journey that goes back to their college years. As third-year engineering students in 2015, they exchanged ideas to develop a personal safety device for women. Little did they know then that their crowning moment was only a couple of years away. Today, women’s safety is much in focus as crimes against women are on the rise all over the world. In an effort to address this issue, the Anu and Naveen Jain Women Safety XPrize competition was launched in October 2016 — calling for a safety device for women using technology. The challenge was to develop a device that would autonomously and inconspicuously trigger accurate location alerts during an emergency while transmitting information to a network of community responders — all within 90 seconds. Not costing more than $40 to make it affordable, the device was expected to work even in low connectivity places and across a variety of environments including high-rise buildings, college campuses as well in public transit and at home. Open to people from all walks of life, the competition initially had 85 participating teams worldwide including university students, scientists, engineers, parents and victims of abuse too. As the competition progressed, it narrowed down to 20 semi-finalists. Eventually, five finalists arrived in Mumbai where their devices were field tested in a real-world environment for three specific features — a robust trigger, reliable connectivity and location awareness. The judging panel dictated the timing and location of up to 30 alerts for the teams to respond to while aboard a public bus and going along an unknown route of travel. There was no network infrastructure provided either. Safer Pro met all the stipulated guidelines to emerge the winner. Priced at Rs2499 (about Dh131), this watch carries a red button that can be pressed during a panic moment and immediately alerts the family to track the live location. “We are getting a lot of interest in Safer Pro from [places such as] Peru, Brazil, Riyadh, Italy, France, Columbia and Mexico. We are now working on the second part of the equation after alerting how to speed up the delivery of help to the distressed individual,” says Avinash Bansal. In 2014, the five engineering students first developed a safety device for women that incorporated technology into a wearable accessory. The device — masquerading as a pendant — was worn in a necklace. When pressed, it wirelessly connected to the wearer’s phone and sent alerts to family. It fetched them many laurels including the Ericsson innovation award. This innovation found the team a place among the top 10 innovators who accompanied Prime Minister Narendra Modi’s delegation to Silicon Valley to participate in the first India-US Startup-Konnect. Subsequently, it was developed into a full -fledged product under their start-up, Leaf Innovation Pvt Ltd, in 2015. While the ‘Safer Smart’ jewellery was much appreciated, it had some drawbacks. In their collaboration with Reliance Jewellers, the size of the pendant was then reduced to one-third of its initial size and then sold through Reliance stores in five different design variations. It needed a smart phone to work and was reliant on internet connectivity. Internet connectivity is a major problem in a country like India, says Chiraag Kapil, the team designer. The challenge was to create something that is not dependent on internet connectivity. Keeping in mind the drawbacks of the jewellery, the team came up with a wearable accessory on the wrist and the answer was Safer Pro —an inconspicuous watch. Equipped with a chargeable battery, it works on GSM (Global System for Mobile Communication) technology and does not need a smart phone to work which means even if an assailant throws away the victim’s phone, she can still reach out to her family. Safer Pro will be released in the market next year. “It is not enough in alerting the family when endangered, we are now working on the last mile connectivity of help as well,” says Manik Mehta, who handles finance at Leaf Wearables. “XPrize as a platform gave us a huge opportunity to showcase the growth and development of innovation and technology in our country. The problem of women’s safety exists globally and being from Delhi, we understand the problem. We are hoping that with XPrize credibility, India will be looked as a hub of innovation and where technology companies don’t only build products but thrive, ” says Mehta. The road to any new invention is fraught with challenges. Bansal says anything to do with hardware requires huge funds. Kapil remembers the team conducting tuition classes for children to raise cash and using their pocket money to work on their project. Their determination and hard work brought in the much-needed funds. “We used to participate in as many innovation competitions as possible. Winning Dh30,000 at the Student Lab competition under GITEX Dubai in 2014 as prize money was our eureka moment. That was a good motivation,” says Bansal. The team raised nearly Rs35 lakh in a year by winning other contests including one in Singapore at Nanyang University. Besides, the competitions connected them to new mentors. Manufacturing woes was the other stumbling block. While the internal parts and software is produced in-house, the final moulding is outsourced to a company in Taiwan. “Though technological strides are being made in payment modes and communication, like chatting, when it comes to safety, it is stagnant. 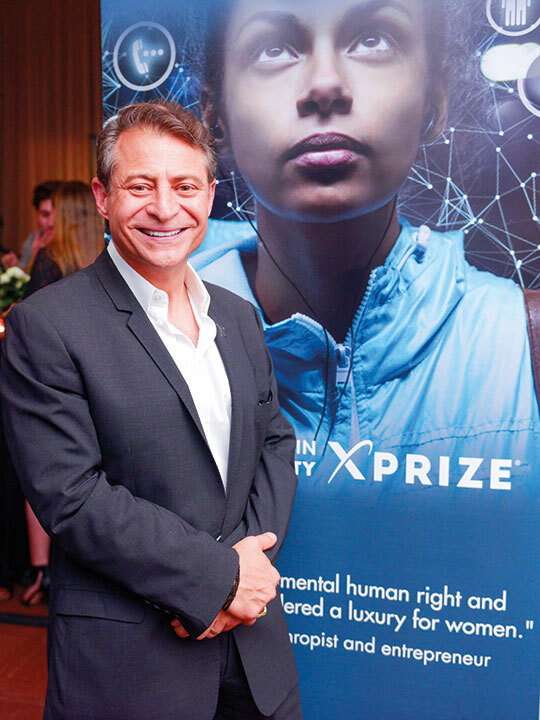 With the XPrize we will have the support of global tech influencers and the close-knit community of XPrize,” says Bansal. Safer Pro is a valuable device to keep women safe and independent.